From a western perspective, making sense of the ever evolving politics of the Middle East can at times feel like refereeing a football match in which both sides are wearing the same colours. The governments of the west seem equally befuddled, condemning the Islamic fundamentalists of some nations while selling arms to those of another, and dropping bombs on both the terrorists and the government forces fighting them. Thankfully. 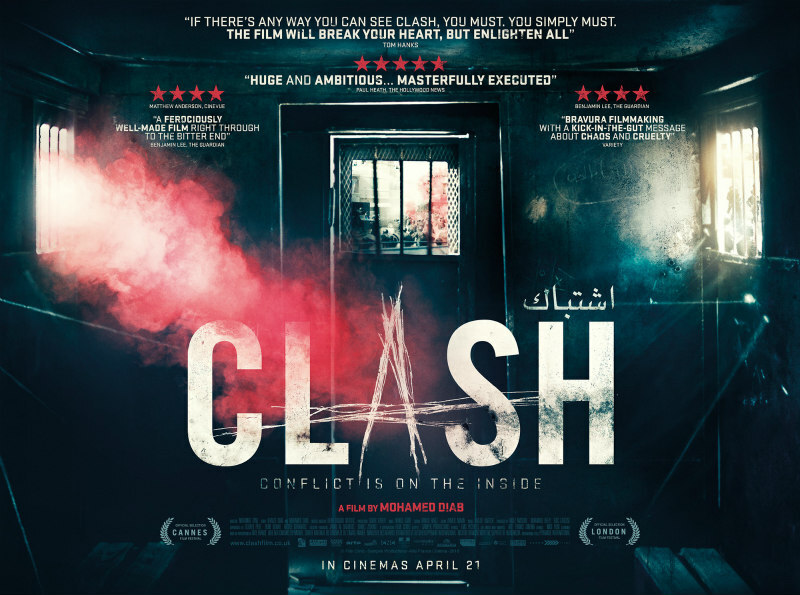 Egyptian filmmaker Mohamed Diab simplifies the political background of his claustrophobic drama, Clash, without ever dumbing it down. The movie begins with some text that explains in simple terms how at the time of the movie's events, 2013, the Egyptian Army have ousted the Muslim Brotherhood from power, leading to street clashes between supporters of both groups. It's a lot easier to comprehend than the opening crawls of any of the Star Wars prequels, and it sets the scene for the drama to follow. Diab's camera stays in the stuffy confines of a police truck (what we might call a 'Paddy Wagon' or a 'Black Mariah'), first introducing us to an Egyptian-American journalist (Hany Adel) and his locally hired photographer (Mohamed El Sebaey), the pair arrested after finding themselves caught up in the trouble. They're quickly joined by a group of secularists, arrested despite their support for the authorities. Things really heat up with the addition of a group of Muslim Brotherhood supporters, causing ructions between the two factions as they verbally and physically spar like two dogs in a one-dog kennel. The obvious western parallel for Clash might be something like Sidney Lumet's Twelve Angry Men, but it excises the idea that one voice can make a difference. Here, in the dankness and darkness of Diab's mobile cage, a single voice struggles to be heard, let alone listened to. Both sides argue their case, not always convincingly, but neither wins any ground. What little amity emerges comes out of mere necessity, like when a small bottle of water is passed between the two parched cliques, or how both groups of men agree to turn their backs to allow a young girl to relieve herself. The physical toil of the truck's seemingly endless journey is so tangible that I recommend you take a trip to your cinema's bathroom before taking your seat, and bring a bottle of water. The smell of sweat and urine emanates off the screen, and if you struggle in confined spaces this could test your resolve. Though the camera remains inside the truck at all times, we do witness events outside through its windows, meaning Diab's film goes far beyond a simple one location character drama. It's actually quite a large-scale production, with hundreds of extras engaging in elaborate battles viewed through the steel bars of the cell on wheels. The horrors we witness create a sense of tension as we begin to realise things may not end well for our reluctantly assembled protagonists. It's testament to Diab's film that despite so many characters on screen, we get to know all of them to some degree, along with their level of political commitment. Some are fully in the tank for their beliefs while others just seem to be along for the ride, and some of the lesser educated detainees appear to have been duped by the intellectuals among the group. The hook of Clash is such a high concept it could be reworked to suit pretty much any cultural, political or social divide, and I would gladly watch remakes of this set in 1980s Northern Ireland or civil rights era America. I fear few filmmakers would offer such nuance as Diab however. Clash is on Netflix UK now.